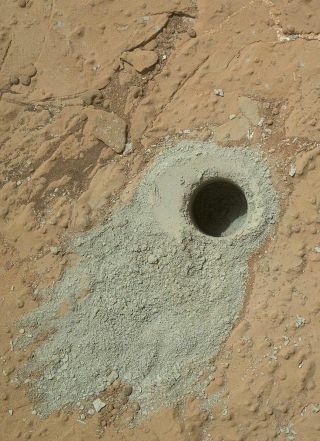 NASA's Mars rover Curiosity drilled into this rock target, "Cumberland," during the 279th Martian day, or sol, of the rover's work on Mars (May 19, 2013) and collected a powdered sample of material from the rock's interior. SAN FRANCISCO — NASA's Mars rover Curiosity has found organic chemicals — the carbon-containing building blocks of life — on the Red Planet. The discovery is not evidence that life exists, or has ever existed, on Mars, researchers stressed. But it does mark the first time that organics have been confirmed inside Red Planet rocks, and it checks off a chief goal of the rover team. The rover's Sample Analysis at Mars instrument (SAM) detected chlorobenzene and several other chlorine-containing carbon compounds in samples from a rock called "Cumberland," which Curiosity drilled into in May 2013. SAM uses a tiny oven to cook samples, and then analyzes the gases that waft off. Martian soil and rocks commonly host a chlorine-containing chemical called perchlorate, which can destroy or alter organics during this heating process — a fact that has complicated Curiosity's hunt for life's building blocks. In late 2012, for example, mission scientists announced that SAM had spotted simple chlorinated organics in samples taken from a different site, called "Rocknest." But they have since determined that this earlier detection probably picked up carbon carried to Mars within SAM. That's not the case with the more complex chlorobenzene, dichloroethane, dichloropropane and dichlorobutane discovered inside the Cumberland sample, researchers said. "This is the first in situ detection of organics that are from Mars samples," Caroline Freissinet, of NASA's Goddard Space Flight Center in Greenbelt, Maryland, told Space.com. Freissinet is lead author of the paper detailing the Cumberland results, which has been submitted to the Journal of Geophysical Research. The apparent ubiquity of perchlorate on Mars makes it tough to know if the original Cumberland sample contained chlorobenzene and the other chlorinated compounds, or some other types of organics. Freissinet, however, is leaning toward the latter explanation. "Everything is Martian — the chlorine and the carbon — but it's from two different molecules, and it mixed together in the SAM oven," she said. "The aromatic [carbon] ring was certainly there in some form or another," study co-author and SAM principal investigator Paul Mahaffy, also of NASA Goddard, told Space.com. "That didn't get made in the oven." At the moment, it's impossible to tell whether the Cumberland organics were produced by living organisms, Grotzinger said. He hopes Curiosity's discovery helps guide the planning effort for NASA's 2020 Mars rover mission, which aims to collect samples for eventual return to Earth. "Let's get 2020 up there to follow this program of where the best rock materials are to return to Earth," he said. Curiosity scientists also announced two other big discoveries on Tuesday— the detection of an intriguing and mysterious spike in Mars' atmospheric methane levels in late 2013 through early 2014, and the ratio of hydrogen to deuterium (also known as "heavy hydrogen") in the Cumberland sample, which yields clues about when the Red Planet lost much of its surface water. Curiosity touched down on Mars in August 2012. It is now exploring the foothills of Mount Sharp, which rises 3.4 miles (5.5 kilometers) into the Red Planet's sky from the center of the huge Gale Crater.